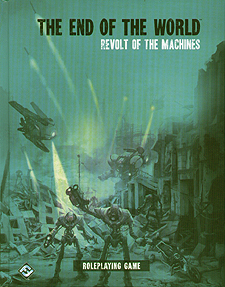 Could you survive a the revolt of the machines? It is the end of the world as we know it. Our technology has turned on us. Machines take on a mind of their own and they no longer wish to serve their creators. They were invented to make our lives easier, but they now serve only their own malevolent intent. Across the nation, cyborg agents battle skeletal kill-bots, and humanity is caught in the middle. Life-giving medical nanites replicate out of control devouring every living cell on the planet. What can humans do in the face of annihilation at the hands of our own inventions? Five unique scenarios of the Apocalypse that each include locations, NPCs, and mechanical horrors!